As the leaves turn and the nights draw in, the youngest pupils at The Grammar School at Leeds (GSAL) spent a day celebrating all things autumnal. 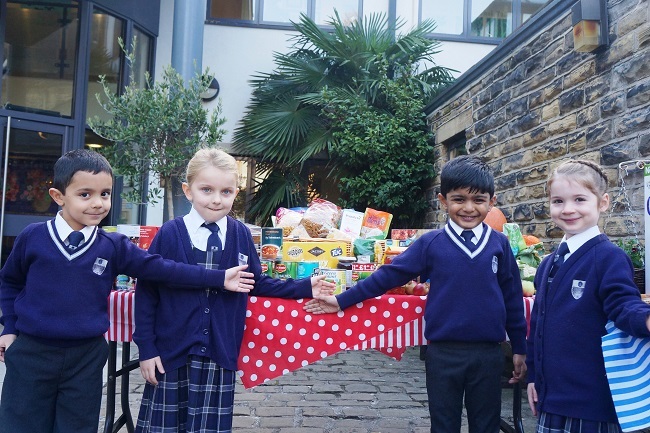 Pupils in Year 1 and Year 2 at Rose Court, GSAL’s nursery and pre-prep, invited their families to a special harvest assembly during which the children reflected on everything they feel grateful for in their daily lives. Led by music teacher Mrs Chris Turner at the piano, they sang songs about celebrating the harvest, the beautiful world we live in and shopping for their favourite foods, rounding off their performance with a rousing chorus of Big Red Combine Harvester. In between the songs, pupils clearly recited their lines giving thanks for the people in their lives and all the food and fun things that they enjoy every day. On the way into school children and their parents dropped off food items for the harvest collection. The goods will be donated to St George’s Crypt, the Leeds based homeless charity which focuses on accommodation, training and mentoring to transform lives. The children in Nursery and Reception enjoyed their own special occasion with their annual ‘autumn day’. Dressed in autumn colours rather than school uniform, the children spent the morning on seasonal activities. During an autumn walk in the sunshine on the school field they gathered autumn leaves to make crowns. Back in nursery, they carved pumpkins, made tree pictures, played with fallen leaves and cooked their own delicious soup and bread.